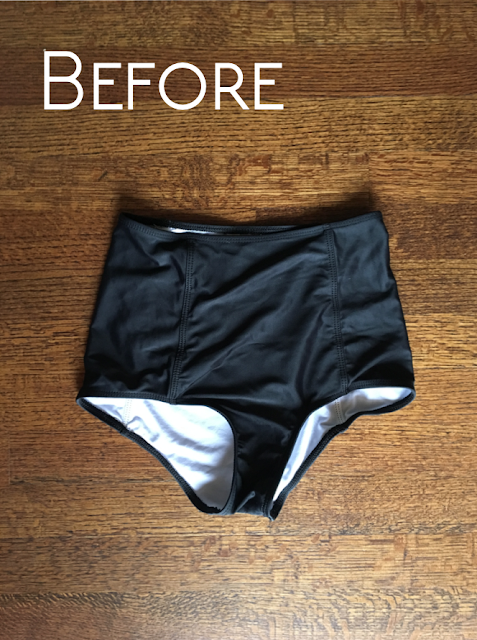 This used to be my "adult size" swimsuit. It was a bit too small on me, so it just sat in my drawer for YEARS. I pulled it out the other day and almost put it in our goodwill pile, but then I decided to give it new life. Getting rid of clothes is hard to do! It's hard because maybe the style isn't the best anymore, or the fit ins't right, and you wasted money and energy on those clothes! Here's a solution ladies! Before you get rid of the clothes you don't wear, see if you can slightly alter them and give them to your kids. I've been doing this for years! If something shrinks in the wash - the kids get it. If I have a tee or sweatshirt I no longer love - it becomes my kids pajamas. And, if I'm about to donate something, I stop and see if there's some way to make it smaller for my kids first. 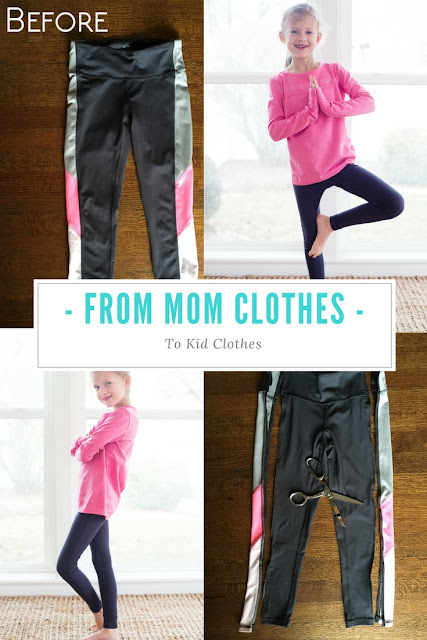 This saves me from having to buy them so many new clothes, (that they just grow out of by next month... am I right ladies?) and I feel better about stretching my dollar. Let's get started turning big clothes into small clothes. Put the clothes on INSIDE OUT. 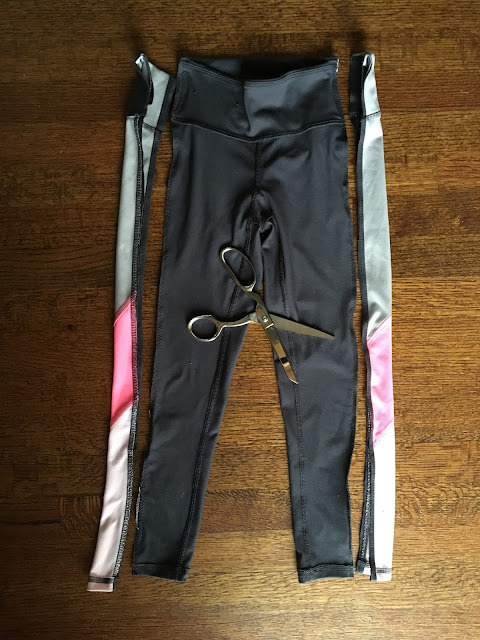 Find the side seam, pinch in the sides to your desired fit. Make sure both sides are even. Carefully pin the clothes so you know where do sew. You can also mark with chalk so you don't get poked. Take off the piece, sew where you marked. If your fabric is stretchy, use a zigzag stitch. Try on the clothes to see if it fits. Trim away extra fabric. I didn't need to alter the top because it fit her! Ya, that's how small it was on me, haha! However, if I did need to alter it, I would have taken in the sides, and maybe shortened the neck strap so it is high enough on her chest. Here's another example. I had some capri yoga pants that I never wore. Put them on inside out. Pinch in at the sides. Sew along markings (zigzag stitch because of the stretchy fabric). Try on and see how it fits. 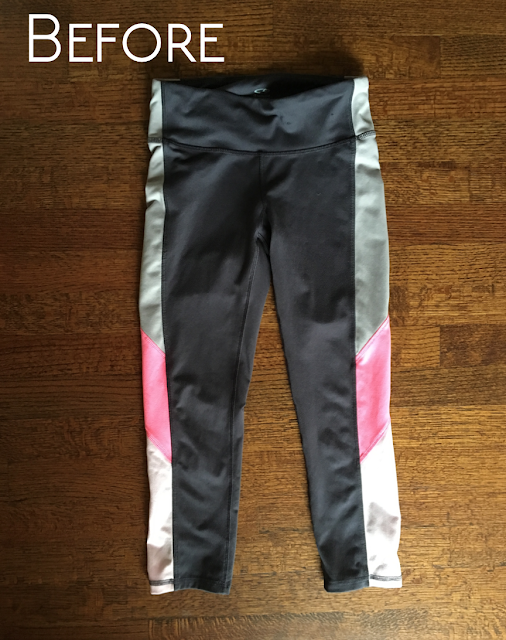 I completely cut away the pink and light gray colors on the sides. We didn't need to hem the bottoms because as it turns out, adult capris are the perfect length for kids pants. These fit perfectly and she wants to wear them every day. I don't blame her! So there you have it - recycled clothes are the way to go! I want to do more posts like this in the future, so stay tuned!